This webpage is fooling you. The cells in our eyes don’t see color; just brightness. The cells in our retina (the “screen” in our eyes) only send brightness messages to our brains. So how do we see colors? It’s a neat trick! The retina’s cells have four variations: some are more sensitive to Blue/Purple light. Some are more sensitive to Green light. Some are more sensitive to Red light. Those “selective” cells are called cones, and the fourth type of cell, “rods,” simply tell the brain how bright things are overall. 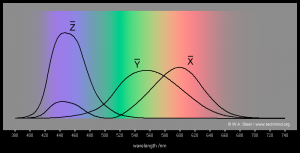 The rainbow-ey graph to the right shows the sensitivity of our cells to each color range. So how do we see millions of colors? Compare the cells. If you see Blue-Green light, your blue and green cells signal “bright” and your red cells signal “dim.” Purple is interesting, because it sets off your blue cells and red cells – check out the sneaky extra bump on the red curve. Yellow sets off your red and green cells, without setting off blue. Neat! But you can fake yourself out! Show your eyes blue light and red light, and you think you see purple, even though it’s not there! Show yourself red light and green light, and your eyes see yellow. It could be “real” yellow, or red+green, and you can’t tell the difference! Guess what? You’re using it right now. This webpage is not white. This sentence is not purple. It is showing you combinations of Red+Green+Blue, and your eye sees white, purple, or any color you like. Don’t believe it? Sneeze on your screen. I’m serious. Tiny drops of water act like magnifiers. Put a drop of water on this screen, and you’ll see the red/green/blue lights separate. 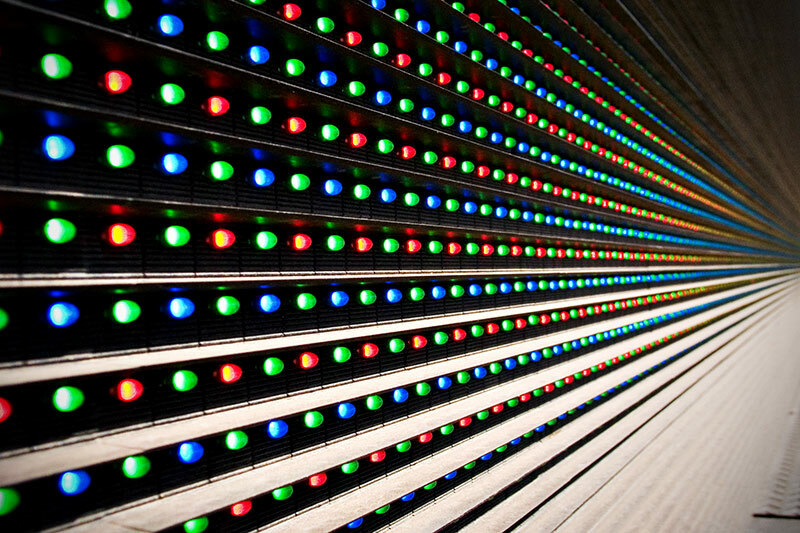 If you get close to a giant screen at a sports stadium or Times Square, you’ll see there are only red, green, and blue lights, packed side-by-side. This is what the photo above shows; notice how the lights in the distance mix into orange and teal. In fact, all web pages tell the screen what color to appear by simply sending a value for red, green, and blue. Want to try color mixing yourself? Move the sliders below and make any color you like, using only three colors.